Well, to be even more specific, the fourth graders at my childrens’ school are awesome. Today, they reenacted the events that took place in the Garden of Gethsemane, with a twist. 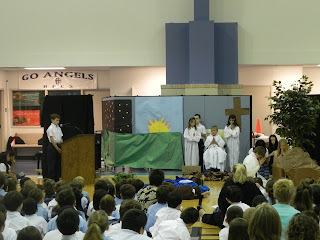 They did the reenactment from the perspective of the disciples, showing what they might’ve been dreaming about during the hours when Jesus had asked them to pray. The disciples dreamed of parables and the fourth graders did a beautiful job of showing reverence and humility. 400 children sat quietly for an entire half hour. It was really touching. 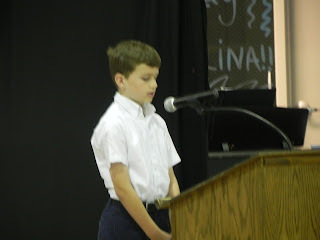 I was certainly very proud of Will, who served as a narrator. 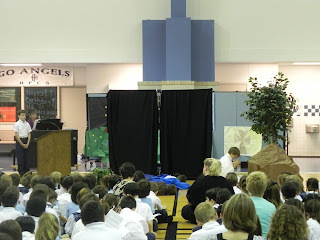 This morning I was given another reminder of why we choose to send our children to Catholic schools. Thanks to Marisa for taking such lovely photos. My camera was sitting on the washing machine at home. Perfect place for it, don’t ya think?